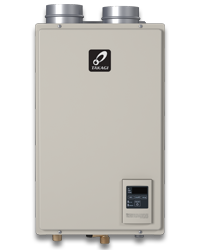 The T-H3M-P is a new breed of tankless for smaller spaces. This model also uses existing 1/2" gas supply lines and inexpensive PVC venting to lower installation costs. The 9008846005 PVC Adapter for Common Venting.